This was an excellent private tour, which was also incredible value. Both the guide and driver were first class. Everything about this tour exceeded expectations. First, this company is very professional. We received confirmation of our pickup time and contact information for the guide the evening before the tour, as advertised. Our guide arrived at our hotel early and ready to go and spoke fluent English (not always the case, as we discovered). Throughout the tour, our guide provided lots of interesting information about Thailand, but was also very attuned to our specific interests and didn't try to push any of the tour options that didn't appeal to us. We arrived early enough to enjoy the floating market before the crowds showed up. We were primarily interested in taking photos and being there early permitted us to get some great shots! Since we weren't really there to shop, we didn't need the extra time to hang out in the town after doing the canal boat part of the tour. We were able to easily locate our guide and had no problem coming back to Bangkok early. Definitely worth it for the private tour! Really enjoyed this trip, boats around the market was good, although it appears that all the stalls have been to the wholesalers. Elephant riding on the way back to Bangkok was super. This tour started early however after seeing what it entailed we could’ve definitely started later and slept in. The coconut farm is something that could be left out all together. This floating market definitely reads as a tourist trap...although I do not regret going, it’s one of those things you do once for the experience and never have to do it again. This tour started with a ride on what they call long tail boats. It takes you through canals/waterways where you can see the homes of Thai people. The river itself is murky and looks dirty though the tour guide claims it is not. Then you transfer to a paddle boat. If you want to ride on a shared boat, you have to wait in line. If you want your own private you will still wait in line and costs Bhat 600.00. It is not included in the price of this very expensive tour. There is nothing special about the Floating Market. The vendors are lined up to the side of the canals, and if you show interest, the paddler will stop. We went on a Sunday which I highly recommend you dont do, also not on a Saturday. It was so crowded we waited a long time for a boat and it is like bump car city. You can get hit by another boats front or end and you have to pay attention and either push or kick another boat if you are at risk of getting hit. NEVER put your hands on the boat edge. At the end our paddler, a woman was screaming and crying because the traffic on the canal was so bad and it took us almost 45 minutes just to get off. There are food vendors also on boats. I can imagine a long time ago where one might be comfortable buying food from the boat vendors and eating. That is the fun part of the floating market and thats basically it. However, if, like me, you have doubts about sanitation, follow your instinct. If you want to eat Thai street food that is unbelievably cheap, go to the 5th floor of Terminal 21 in Bangkok. I promise your head will spin with all the choices available and under much more sanitary conditions. If you must go and experience the market save money and join a group tour. The tour guide has a very heavy accent and I did not understand most of what she said. My recommendation is to skip this event. We asked to stop for an elephant ride. One, it is quite costly, BHAT 600.00 per person. The place where the elephant goes is full of elephant dung, it is not kept up. Two, do not forget that elephants can be mercurial creatures. We had an episode and the elephant almost crushed my husband against a tree and I was certain we would fall off. Luckily we did not. Be careful. It was at a place called Damnoen Saduak Elephant Park. Worth to go. Tour Guide is informative and professional. Driver is very kind and good. Floating market was quite touristy but nonetheless a very worthwhile visit to something quite unique and novel. Getting there speeding down a canal in a long tail boat was really exciting. We then had to pay a little extra to take a smaller row boat around the market itself. although we bartered on the price offer one-third asking price and settled for half we still found same items a quarter of the price in Chiang Mai walking street market a couple days later. But hey ho it was a really fun experience. Stopping at the orchid farm on the way on the way could have been missed - essentially a large and expensive souvenir shop although it was interesting to see all the things they make from coconuts. Our guide was fun and jolly but didn't really tell us much about the floating market, settling instead just to chaperone us around. Guide arrived promptly at 8am and we were back at hotel Lebua State Towers in central Bangkok for around 4pm. Journey time each way around 1 hour. Very interesting and novel day out which I'd recommend. Was a pretty cool tour. 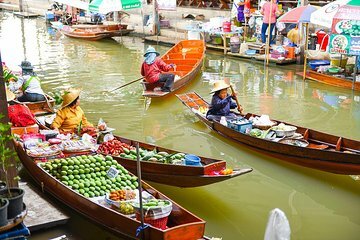 Anyone going to Thailand should experience at least one floating market. Pricing on the items are a little high compared to the in town markets, but still relatively cheap. Only reason I didn't give it 5 stars, the actual fee for the boat in the floating market was not included. Other than that it was overall a good experience.